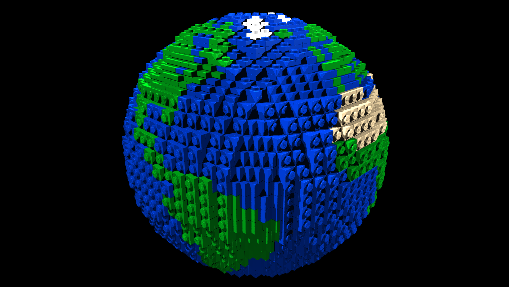 Suppose Slartibartfast made a full-size Earth from Lego (including the oceans being represented as solid blocks. It is made inside his huge cavern inside Magarathea. Magrathea is an ancient planet located in orbit around the twin suns Soulianis and Rahm in the heart of the Horsehead Nebula. Clearly the gravitational force of the artificial Earth would affect it in some way. Presumably the core would melt but the surface would still consist of individual blocks. What would a cross-section of this planet look like in terms of layers? At what depth would Lego blocks be welded together by pressure and at what depth would they melt? Units in diagram are all in millimetres. Let's get out the calculator. Result 2: The core does not melt. As we don't have a density gradient to the core made from metal but the same plastic, the core does not melt. Cubic construction: Construct it like a cube, but stop building when you reach a spherical boundary. (It turns out that, because the so high Young's Modulus as compared to UTS value, it doesn't matter if you do a cubic construction, or spherical shell, or whatever). Isothermal (or slow) construction. There's plenty of time for heat to dissipate to (or from) the environment, thus the temperature of the entire structure is the temperature of the environment (in the vacuum nothingness of space, that would probably be around 3K -- but then we're back to insufficient data. So, our environment will magically be held at 300K). For an estimate of how slow the construction rate has to be in order to be isothermal, one would need to know the thermal diffusivity of ABS (or, equivalently, its heat capacity and thermal conductivity). Young's Modulus at roughly 2~5 GPa. That means, it needs these kinds of pressure to cause a significant deformation in percentage compared with the original size within the linear hookean regime. Bending Modulus (or flexural Modulus) is also about 2~5 GPa. This means that these are the pressures that will cause significant curvature change (at least in the context of linear hookean elastic plate theory). Ultimate Tensile Strength (UTS) is about 40 MPa. That is "the equivalent" of the Young's Modulus for plastic deformation regimes. This means, at these stresses, the deformation will be plastic (instead of elastic), and will lead to tensile rupture. Flexural Strength is about 72 MPa. That is "the equivalent" of the bending modulus for the plastic regime. At these pressures, it will lead to rupture. Basically that means, that the lego blocks basically don't deform much, but they soon break: it doesn't stay too much in the linear regime. Where $G$ is the shear modulus (describes what happens when one applies shear stresses), and $K$ is the bulk modulus of the material (proportional to the change in volume of the object under hydrostatic pressures) (we won't use $K$). $\nu\approx 1$ means the brick will tend to volumetric expand/compress under pressure, instead of giving preference to the direction we're applying the stresses. Also, $G$ and $K$ are close enough to $E$, meaning, it resists shear stresses, tensile stresses and hydrostatic pressures around the same way (or, strain responses are in the same order of magnitude). All of this data is much less than UTS and Bending strength, meaning, linear analysis is meaningless for pressures in the megapascal range. All of this, suggests the existence of a critical radius, call it $R_c$, which will aid the transition between an ABS blob, and the bricks itself. When pressures go above 40 MPa, rupture will happen, and the structure will collapse, as the material won't be able to support it, and, the lego blocks will disappear, and all we have is granular ABS under hydro-static pressures. Where $p_c$ is the critical pressure (that is, the pressure at the critical radius). The critical radius itself is not a region where the thing suddenly change its behaviour. It is a smooth transition. To calculate the exact radial size of the transition region, we would need the Yield Strength Point of the ABS, which is a data that we do not have. But, it is probably safe to say, under a good approximation, that the size of the transition region will be much less than the radius of the entire planet. With that in mind, we approximate saying that the critical radius is a point of sudden change. Thus, under the critical radius, we have ABS blob, and below critical radius, we have completely intact lego bricks. I know, not realistic, but again, we do not have the Yield point, and, transition region is probably too small. This time, given lego blocks are intact, $\rho$ is assumed to be constant, and the density of the lego bricks. We know from Young's Modulus, the lego won't deform significantly at all, thus, no change is density is good enough approximation. Where $R$ is the radius of the lego planet. Finally, calculation of the Critical Radius! Finally, the thing that we are aiming to calculate! If we plug the critical pressure to be 40MPa (the UTS value), we get $R_c \approx 0.10 R$, where $R$ is the total radius of the planet. We calculate the pressure everywhere in the planet: At the critical radius, above critical radius, and below critical radius. Thus we can build a full radial profile of the pressure. I am too lazy at the moment to plot it. But if anyone want to do that, go ahead and edit my answer. I might do it later (or I might never do). I think that this answer should have been a comment, but it would be too long, thus, an answer. Feel free to remove this answer. What would a cross-section of this planet look like in terms of layers? Depends on the construction. Isn't that obvious? If you construct it like a cube, having a cubic world in the end, and remove the legos until you get a sphere.. the cross section will be..... well..... you got it. If you construct a spherical shell at each time.. you will have a different cross section. At what depth would Lego blocks be welded together by pressure? Depends on the construction. Resistance of materials is highly dependent on its geometry, and where the forces are being applied. The same amount of material can resist much more or much less, if it is made in a certain shape or geometry. 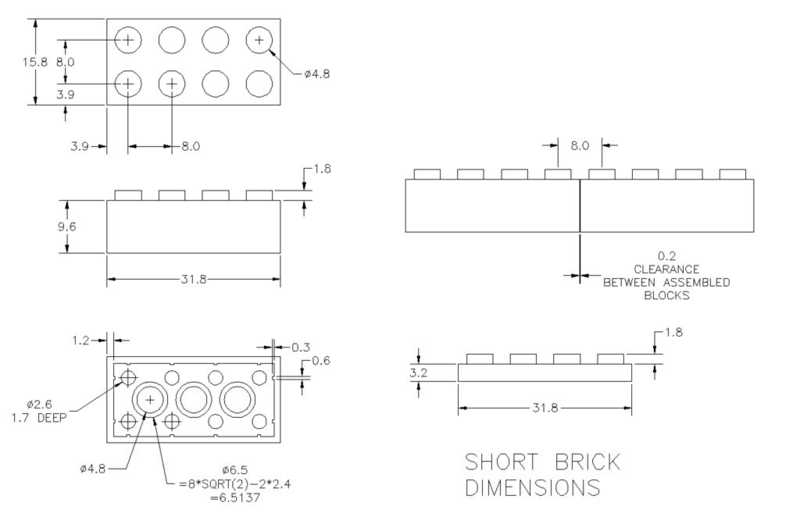 Each type of construction will yield different types of forces applied under the geometrical form of the lego block. The material response will be different at each of them. For instance, a cube like world, the forces will come at all different shapes and and angles across the lego block, for different positions in the interior (that will create significant shear stresses in almost all blocks). For a spherical-shell-by-shell world, most of the forces will be radial (thus less shear stresses on the block). And so on. Each of these cases, will have a different response from the lego blocks. More, if the pressure is too high, it is possible the lego might break, and even granulate, so we will have to look at the responses of the ABS itself (young modulus, bulk modulus, shear modulus, etc). The maximum I can do, is to calculate the pressure profile assuming the entire thing is a continuum body (no empty spaces), and search if there is an area which surpasses the material properties of ABS itself. If $R = 6371 Km$ and $\rho = 565 Kg/m^3$, we get $p(0) = 3.6224 GPa$. Though, I couldn't find anywhere Young's Modulus and Shear Modulus of ABS, to make a comparisom and determine if it will collapse or not. But, as you can see, it is well within the Young's Modulus of several (or most) materials, thus, probably within the regime of linear deformation, and thus, no collapse. Polymers and plastics can have very high, or very low Young's Modulus, thus, ABS's data is indeed required. And keep in mind our small analysis assumed a continuum: lego blocks has many empty spaces. 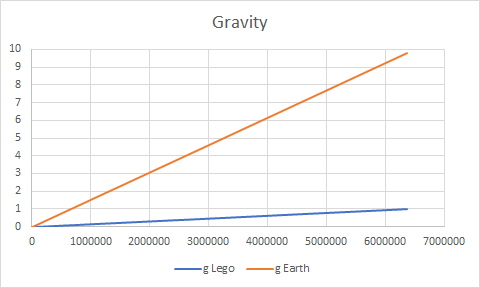 This further increases the need of the ABS data, and how exactly the lego planet is built, for one to make proper calculations. What depth would they melt? Depends on the construction. You can, for instance, do an isothermal quasi-static construction: Put it in contact with a heat reservoir of any chosen temperature, to make sure your entire structure has the same desired temperature $T$, that could be any of your choice. Then construct it quasi-statically: Put the first lego block in place. Wait for thermalization. Slowly, put the second lego block in place, then wait for thermalization. In the end, the entire structure will have the same temperature, and no part of it will melt. Or perhaps you can do a sudden adiabatic construction: If a cubic lego brick earth-sized of bigger, happen to magically appear in our universe (or, to be 'constructed' extremely quickly), they would suddenly feel gravity and deform (or worse: collapse) under their weight. That elastic energy would cause heating, and then the core probably would reach considerable temperatures in the process (further increasing collapse probability), creating a temperature gradient. Your construction methods will likely be in between the two (or not), and thus, the core temperature will be in between the two. Thus, temperature is highly dependent on how you build it. Not the answer you're looking for? Browse other questions tagged planets hard-science alternate-earth or ask your own question. What would it look like inside an Alcubierre field? Earth Orbits a K-Type Star. What Would the Visual Scenery Look Like? What would an earth-sized world be like if shaped like Ultima Thule?